Wave Energy also known as ocean wave power, is another type of ocean based renewable energy resource that uses the immense power of the waves to generate electricity. The Earth has not been called the “Blue Planet” without a good reason. Nearly three-quarters of our planet is covered in water, so it is only natural that the search for a clean, renewable source of energy should lead us to the oceans that surround us. The ocean is full of potential energy just waiting to be tapped. Using the potential energy stored in the oceans and seas to generate electricity ensures that power being generated will be pollution free. Harnessing the power of the oceans waves and underwater currents is nothing new as wave, tidal and hydro power have been used for many thousands of years for sorts of reasons. What is new however, is the way in which we now harness, store and generate electricity from our oceans. Making use of the energy that can be produced by the ocean waves is not easy as the worlds oceans are obviously vast. But these oceans contain a massive amount of usable energy just waiting to be tapped. One only needs to look back a few years to the tsunami in Japan to understand this. While it is clear there is plenty of energy present in the oceans and seas, the question is whether we can convert this stored energy into a continuous renewable energy source. The answer is we are already starting to. Unlike tidal energy from the sea which uses the in and out movement of the tides, wave energy uses the vertical up-down movement of the surface water that produces the tidal waves. The oceans waves are full of kinetic energy (movement) as they move around the oceans, and it is this energy which can be used to power a turbine or an electrical generator. Wave energy collection is a passive process in which the energy of the waves is automatically converted by turbines. Wave energy is also environmentally friendly, as it does not burn any fossil fuels therefore creates no atmospheric pollution, does not alter or interfere with the environment, constantly reuses the same energy resource without removing it, and of course has a very small carbon footprint compared to other forms of renewable energy. While the oscillating motion of the waves may be the same around the oceans, there are a few different ways in which we can harness the energy from the moving waves. Wave power converts the periodic up-and-down movement of the oceans waves into electricity by placing equipment on the surface of the oceans that captures the energy produced by the wave movement and converts this mechanical energy into electrical power. Point Absorbers – which are tethered to the ocean floor. Wave Attenuators – which are long horizontal semi-submerged snake-like devices. Oscillating Water Column – which converts wave energy into air pressure. Overtopping Devices – where the sea waves are driven up the ramp filling-up a small tidal reservoir. These four types of wave energy conversion devices need not be placed way out into the oceans to benefit from the power of the waves. Depending on the distance between the wave energy device and the shoreline, there are three possible locations were wave energy devices can be placed and these are classified as: Shoreline (physically on the coastline), Nearshore (within a few hundred metres of the coastline in shallow water) and Offshore, (a few kilometres from the coastline in deep water). The positioning and location depends upon the type of wave energy device as one has its own advantages and disadvantages. Wave energy has great potential as a renewable energy resource because Mother nature provides us with a large supply of renewable wave energy every day free of charge. The technology already exists for extraction of this free energy as there are many wave energy conversion devices in the oceans around the world at this time generating renewable energy, but there is still a long way to go to make it a reliable and continuous energy resource as there are still many technical challenges to be solved. One of the challenges to overcome in using the energy of the waves is that the ocean waves, although consistent in the fact that the worlds oceans are constantly moving (especially near coastal areas), they are variable as weather conditions and seasonal changes affect the height and swell of the waves. Another major challenge to effectively harnessing the energy is figuring out a way to construct devices that can survive the harsh oceanic conditions as some “wave energy devices” have already been destroyed by the energy carrier itself: “the sea”. However, if the technology and efficiencies are improved large scale offshore wave energy can provide many advantages compared to other forms of renewable energy sources. 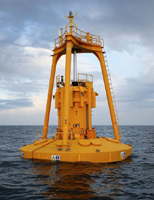 One of its main advantages is that wave energy is generally considered to provide a clean source of renewable energy with limited negative environmental impacts with very low or zero CO2 emissions. Wave energy also has negligible land use and large scale implementation of wave power technologies could help stimulate declining shipbuilding and dockyard industries that could help fabricate these metal bodied wave energy devices. Despite the challenges of harnessing the power of the waves, there are still plans to build wave energy farms throughout the world. Like solar and wind power, wave power is completely green, completely clean and completely sustainable. The challenge is to figure out how to do it effectively, efficiently and economically. To learn more about “Wave and how to generate your own electricity using the power of the sea, or obtain more tidal energy information about the various tidal energy systems available, or to explore the advantages and disadvantages of wave power, then Click Here to order your copy from Amazon today about ocean, tidal and wave energy, the energy revolution from the sea. can someone tell me how to measure the power / energy of a swell. i.e. take a small bay – how can I go down to the bay and measure the energy that the swell has say 100 metres out (i.e. further out than where the waves are crashing).